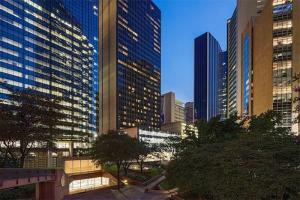 Situated just steps away from Dallas landmarks, this new hotel is within the historic LTV high-rise tower. The hotel is moments away from Dealey Plaza, AT&T Performing Arts Center and Thanks-Giving Square. Enjoy complimentary WiFi, an outdoor pool and sundeck, a fitness center and much more. Guest rooms and suites feature Suite Dreams® by Serta beds, 42" HDTVs with premium cable and more. Located about 6 miles from Dallas Love Field airport.